Please note that this blog post is about #infoshow15, which took place a year ago (in 2015!). The information about what the #infoshow is, and how it is run is still relevant, but the date for #infoshow 16 is Tuesday, May 17, 2016 at 5:00pm. SILSSA is excited to announce details and open self-nominations for the upcoming #infoshow15 at Pratt SILS, to take place on May 15th, from 5 to 7 PM. Before we get to that, however, we’d like to share information about last year’s show! Last year, the Pratt Student showcase featured the following work from students: 8 thirty-minute panel presentations, 13 fifteen minute presentations, 29 five minute presentations, and 14 poster presentations. Topics of student work ranged from presentations on issues of gender and race in libraries, the need for embedded librarianship, how to develop a consistent file-naming standard, a linked open data website of textile collections in museums, usability testing of museum websites, and many more fascinating projects. If you’d like to get a sense of the types of projects presented by SILS students, check out http://research.prattsils.org/ ! 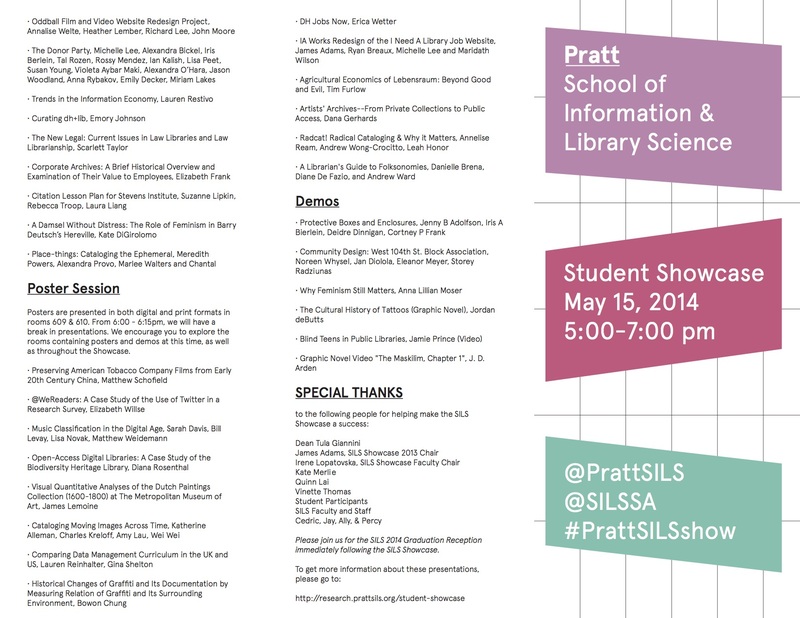 For a sense of the mood and energy of Pratt SILS Student Showcase, check out our Storify of last year’s Showcase! The Pratt SILS Student Showcase, referred to by the new name #infoshow15 from here on, is a great way to share and celebrate student achievements at Pratt SILS. Now that we’ve got you all excited about last year’s student showcase, read on for information about participating in this year’s! What is the Pratt SILS #infoshow15? #infoshow15, referred to as the Pratt SILS Student Showcase in previous years, is the annual showcase and celebration of Pratt SILS student work. #infoshow15 is modeled as a professional event with panel presentations, lightning talks, poster presentations and more. It also gives students a chance to look at some of the work done in classes they may be interested in taking the following semester. #infoshow15 is an opportunity to share all of the work that you’ve done over the past year with fellow students, your families, friends, and the New York professional community. It is an occasion to see what other students in the program have been working on, and celebrate our collective achievements. In addition to providing an environment to present work, #infoshow15 gives students the opportunity to chair panels. This is a great opportunity to bolster your CV and gain professional experience! Chairs will introduce panelists, keep time to ensure that the session stays on schedule and solicit questions from the audience. Chairs are integral to the functioning of #infoshow. 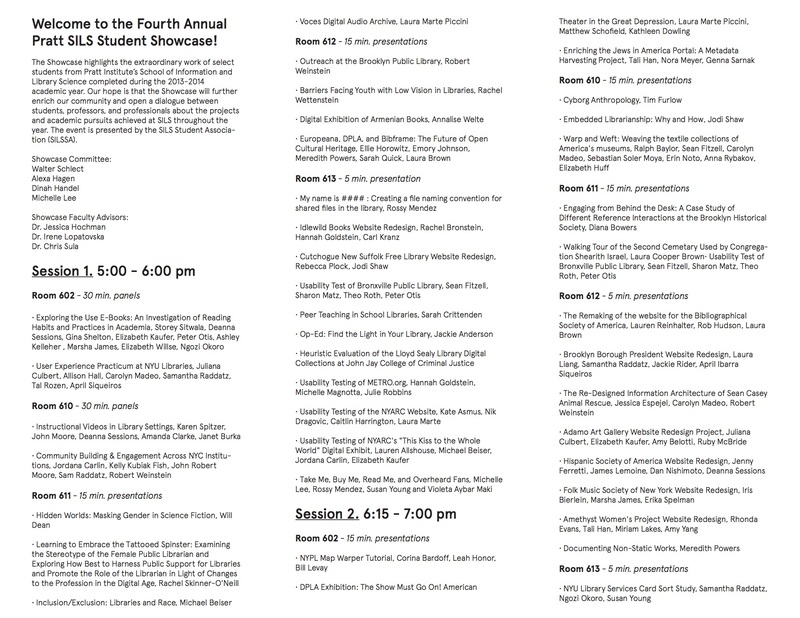 Student projects are included in #infoshow by faculty or self-nominations. When will #infoshow15 take place? #infoshow15 will take place on Friday May 15, from 5 to 7 PM. Following #infoshow15, Pratt SILS will host the graduation party. Workshops for participants will take place in early May, and will provide information and a chance to practice presentations and chairing sessions. This sounds so fun! How can I present my work? If there are too many projects to fit all of them into Student Showcase, the Selection Committee will decide which projects will proceed (this selection process will take place at the beginning of May). The deadline for student project submissions is May 1st.